July — 2017 — St. Finbarr's A.C. The AAI National Masters T&F Championships 2017 took place on Sunday, July 7th last. A small group of seven BARRS athletes made the long trip to Tullamore and enjoyed a very successful day out. Michael Murphy was the star performer with a double Gold in the M/60 800m & 1500m. Martina Kiely was a Silver medallist in the F/35 800m and a Bronze in the 1500m. Denis Coughlan grabbed a Silver in the M/35 800m with a superb sub 2-minute run. Sandra Hickson was a surprise Bronze in the F/35 Shot Putt competing against a very strong field. Club chairman, Eamonn McEvoy completed the medals haul with a Bronze in the M/60 3000m. 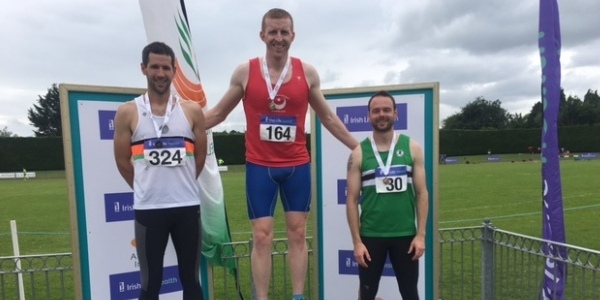 Donal Murray put in some creditable performances in the M/40 Shot Putt, 200m & 400m and Enda Kiernan had to contend with a very strong field in the M/40 1500m. A big well done to all!